« Cookie is Going to Be My New Friend from Hong Kong Disneyland! What’s a Cannoli Siciliani? I just want a Cannoli for Dessert! I’m back! Yes, I’m back at Amici’s Italian Restaurant because the food is super Duffer-lischious and the last time I was here, I forgot to take a picture of my cannoli. I promised myself to get a picture of a Duffer-Spectacular Amici’s Italian Restaurant cannoli for yous guys! So…. yeppers peppers I’m baaaaaack! 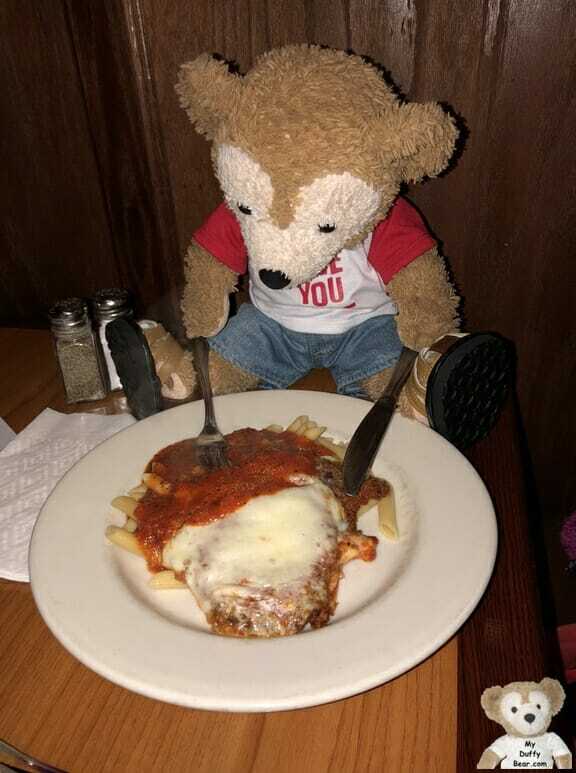 But before it’s cannoli time, I learned that you, well… that humans do certain things when they go to restaurants – so I figured it’s best just go along and do the same stuff too – like eat lunch before my dessert. 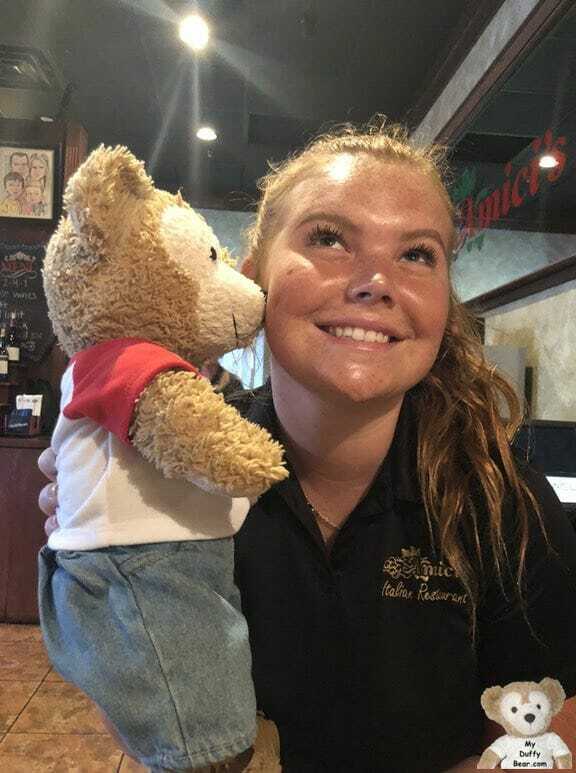 Your Amici’s Italian Restaurant waitress will be Miss Abbey. She is just as sweet and happy as her smile. 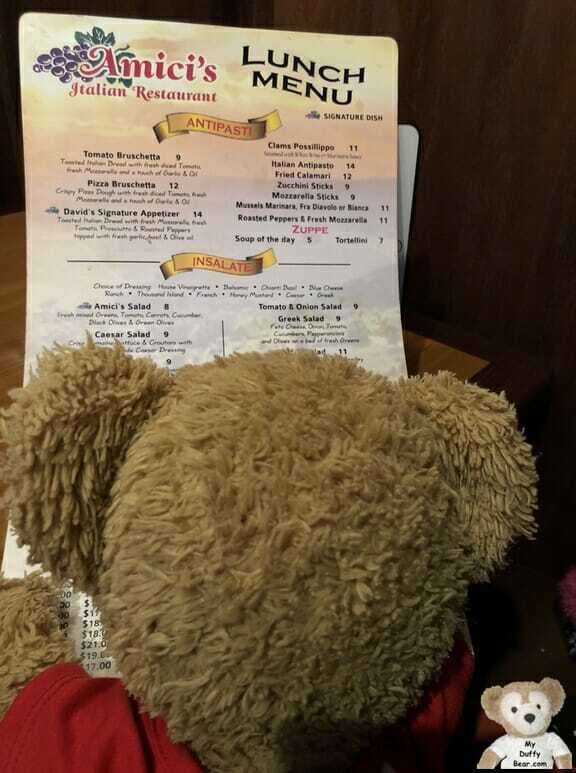 Second, humans read the menu…..
Where is it? I already know what I’m going to eat today! I knew exactly what I wanted to eat for my lunch today. I ordered the veal parmesan with penne pasta on my last visit to Amici’s. It was so yummy – I really didn’t need to read the menu again. I just wanted to look like I knew what I was doing at a restaurant. But it’s never good wasting time, so as I was reading, I tucked away in my cranial stuffing what other duffer-lectible choices are on the menu because I’m already planning my next visit to Amici’s Italian Restaurant. Besides, even though I’ve been dreaming about my cannoli, it wouldn’t be polite just to eat dessert, so I did a repeat of my whole duffer-yumptious lunch from my last visit! Second, the waitress brings me my soda! I like drinking soda. Mommy doesn’t buy it for me anymore at the house. She makes lots of ice tea for me at home, but at least I still get to order a soda when we go out. There’s just some foods that taste way better with soda than water or tea! At least that’s what I think! 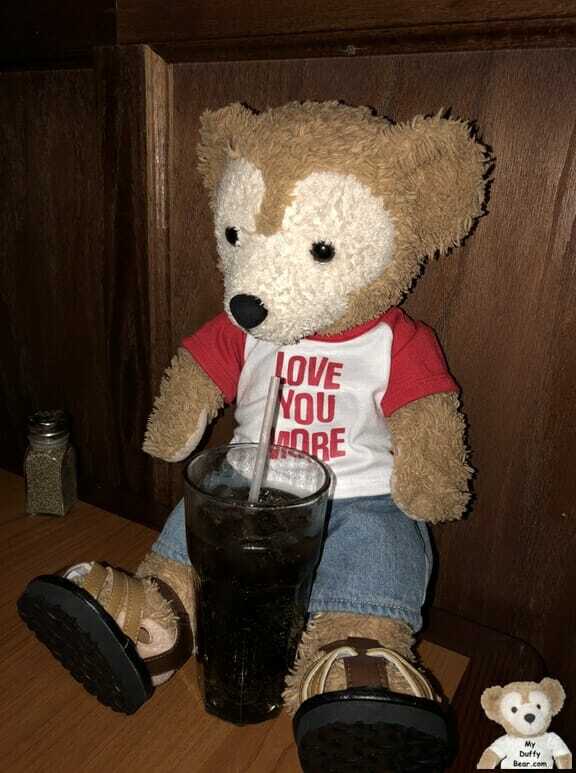 *Slurrrrrp* This coke is the perfect drink for my lunch today! I’m such a lucky bear! Excuse me while I dig into my lunch! The best part of any meal…. …..today was all about my cannoli!!!….. I need a picture of my Amici’s Italian Restaurant Cannoli for my blog post. So how could mommy even think to ask me if I was getting a dessert today? I got really scared because mommy doesn’t always order dessert for me. Second – what’s this Siciliani part?…..
……Huh? *confused ears* I want my cannoli to be just like my last visit to Amici’s. My supper creamy on the inside, crunchy on the outside, chocolate chipped, oh so stitch-lipped mouth watering cannoli! Mommy told me that grand mommy always called cannoli – Cannoli Siciliani. Mommy said it’s because the cannoli dessert came from Sicily in Italy, just like my grandmommy’s family came from Sicily. That just made my cannoli – oh excuse me – Cannoli Siciliani taste even better today! Here it is! Here it is! I’m so very beary super excited! It’s cannoli time! I mean Cannoli Siciliani time! All for me! Right? What makes a delicious meal – even more delicious? Miss Abbey is my new most bestest ever favorite Amici’s Italian Restaurant waitress! 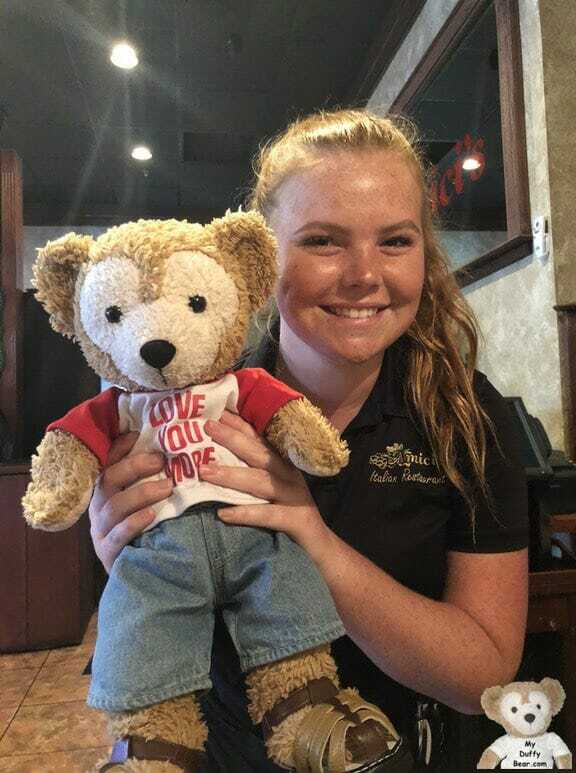 She made sure that my lunch was the very beary bestest that it could be today. Sure I got my coke…. 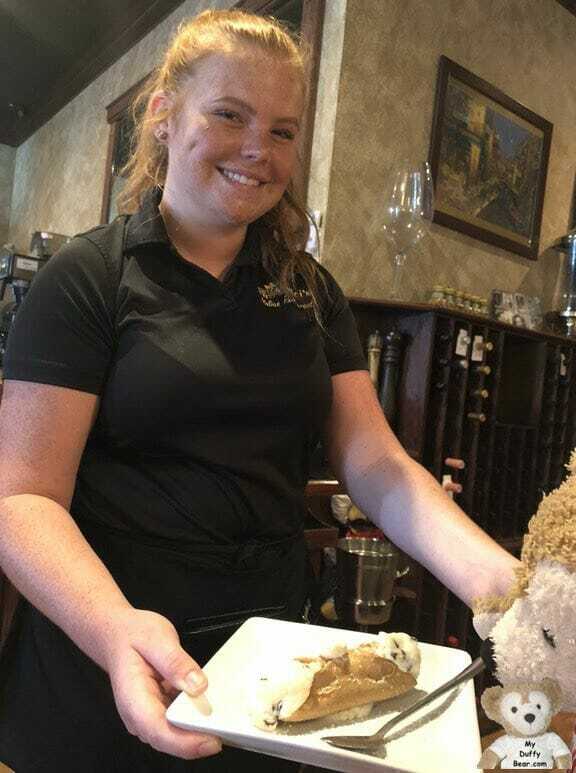 and my veal parmesan….. and my cannoli – I mean Cannoli Siciliani,….. but it all just tasted duffer-much better because of Miss Abbey.